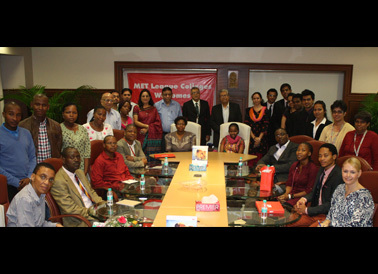 A 16-member delegation from UNISA (University of South Africa) comprising the Dean, faculty members and students belonging to various disciplines visited MET for an idea exchange. After coming to the campus, they first toured MET and were extremely impressed by its infrastructure. Following this, they had an interaction with the Trustees, Director General – MET Institute of Management, faculty and students of MET Schools of Management. In a discussion that lasted for over two hours, many issues were discussed, prominent among which were the varied subjects offered in Management, the structure of Management Courses and the possibilities of collaboration in projects, joint papers and other forms of exchange.